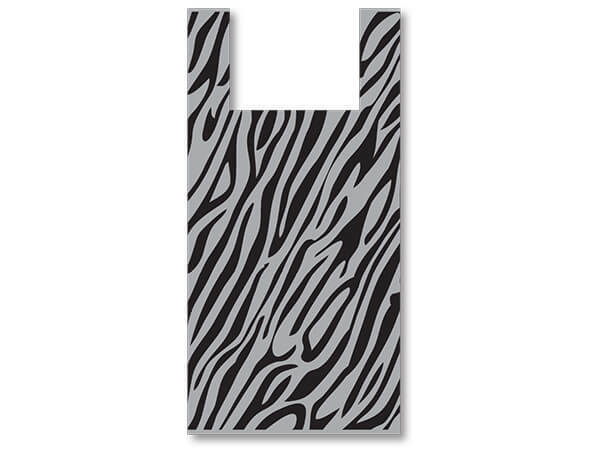 Our Black on Gray Zebra T Sack plastic bags contain 100% recycled plastic and is made in the USA from high quality domestic resins in a clean environmentally rated facility. As a bonus these bags are a thick .75 mil and are printed on both sides with attractive zebra artwork. Green Way® Eco-Friendly Packaging. Encore Recycled Plastic T-shirt bags in wide range of prints. Bags are 100% recyclable and are made in the USA in a top rated environmentally efficient facility from 25% to 100% recycled materials. A Green Way® Eco-Friendly Packaging product.